Här nedan är några publikationer som kan vara intressanta för dig som arbetar i branschen. Dessa är utgivna av Europump eller Hydrolic Institute, den amerikanska branschorganisationen för pumptillverkare. Guiden har tagits fram av Hydraulic Institute i USA. Ni kan köpa denna bok genom kansliet. 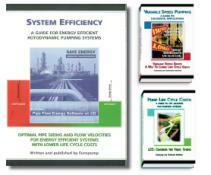 Twenty-two industry experts have compiled a comprehensive book on optimizing pumping systems. Energy losses in the pumping system as a whole are often greater than energy losses in the pumping unit. Read this book to learn how optimizing both existing and new pumping systems and purchasing based on life cycle costs will lead to increased profitability through a reduction in unnecessary, expensive energy consumption and maintenance COSTs. OBS!! ett fåtal “bokpaket” finns kvar på kansliet som vi erbjuder till nedan specialpriser. Priset för alla tre böckerna är 1000.- för SWEPUMP medlemmar och 1500.- för icke medl. (ord. pris är 3000.-). Ett fåtal paket finns kvar till försäljning. Leverans omgående. Reservation för slutförsäljning. The new Europump guide on System efficiency gives clear and authoritative data on how to optimise energy consumption within rotodynamic pumping systems. Applying speed control can save energy, reduce equipment and maintenance costs, increase reliability and optimize pumping system performance by utilizing the most cost-effective variable-speed pump for a given application. The key is to design all elements of the pumping system to function optimally together, for lowest life cycle cost. This guide brings together everything you need to know to design, specify and operate successful variable-speed pumping systems – all in one amazingly comprehensive volume. It shows you, step-by-step, how to take a system approach to incorporating VSDs in your applications. If there’s a viable way for variable speed control to help generate savings on your pumping costs while improving system performance and reliability, this guide will show you how. This guide is the result of a collaboration between the Hydraulic Institute, Europump, and the US Department of Energy’s Office of Industrial Technologies (OIT). Life Cycle Cost (LCC) analysis is a management tool that can help companies minimise waste and maximise energy efficiency for many types of systems, including pumping systems. This guide will assist plant owners/operators in applying the LCC methodology to pumping systems.